1 The cecropia is a colorful moth. Its plump body is red with white stripes. Its wings are reddish brown. Each of the four wings has a white crescent-shaped spot. The edges of the wings are light tan. The tip of each top wing has a black spot. The cecropia moth is a very big moth. Its wingspan is five to six inches. 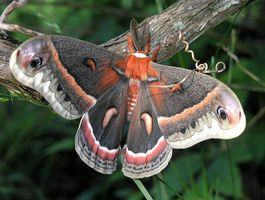 The cecropia moth lives in Canada and the United States. 2 The cecropia moth starts out as an egg. The female moth lays rows of eggs on both sides of a leaf. Two weeks later, the eggs hatch. The little caterpillars, or larvae, begin eating leaves. Cecropia caterpillars eat the leaves of many different kinds of trees and shrubs. These include wild cherry, plum, maple, box elder, apple, willow, walnut, elm, birch, and lilac. Cecropia caterpillars eat for about two months. During that time, they can eat a lot of leaves! 3 Cecropia caterpillars have plump bodies. They grow to about four inches long. Their bodies are a greenish-blue color. Their bodies have two rows of little yellow and blue spikes. Just behind its head the cecropia caterpillar has little bumps. These bumps look like little balls covered with black spikes. The bumps may be red, orange, or yellow in color.